The Linux on iPod developer blog has announced that 5.5g iPods can now run Linux…..in case you’re the type that wants to run Linux on your 5.5g iPod. Many thanks and cheers to the hard work by DataGhost et al. in figuring out all of the final little bits in getting 5.5th gen iPods working with iPod Linux (Winpods and Macpods, 30 and 80 gig units). His various patches have been checked in, and integrated into the current nightly build of the kernel. There‚Äôs a minor patch being integrated today that will allow 30 gig units to work properly‚Ä¶ look for that kernel tomorrow! More information can be found on the 5.5G Wiki Page with respect to installing these experimental builds on your 5.5th gen iPod. 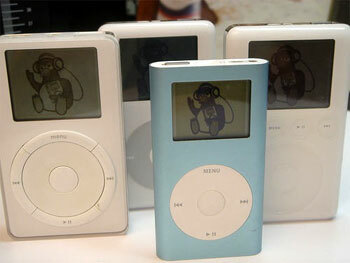 Um, if it’s the 5.5G iPods that it runs on, why are the iPods in the photo anything but the 5.5s? Don’t try it unless you want to go Linux with your iPod. If it doesn’t work for you, reset your iPod and restore it.